Welcome to a new series called Take Five, where we take a look at five of Italy’s celebrated people, be it sports people, novelists, inventors, or other categories. We will select five people who all differ from each other and, whenever possible, from different eras. So to kick off we’ll start by looking at five Italian chefs. Since 2007 Carlo Cracco has been the head chef at Ristorante Cracco on Via Victor Hugo 4 in Milan. The two-roomed restaurant with just 60 covers is where this enigmatic innovator in Italian cuisine creates the dishes that have earned him two Michelin stars. Born in Vicenza in 1965, Cracco’s training at Istituto Professionale Alberghiero, led to his first professional engagement in 1986 working in Milan for Gualtiero Marchesi; the first Italian chef to achieve three Michelin stars. Like all young chefs starting out, he moved from one restaurant to another gaining experience and absorbing new culinary practices. He moved onto Savona, approximately 180km south-west of Milan, where he started working at the Meridian of Garland and later at Relais and Chateaux. After three years working in France, he returned to Italy and secured a position at Enoteca Pinchiorri in Florence, where he was instrumental in earning the restaurant its Michelin stars. While he was still working in Florence, Gualtiero Marchesi asked him to work for him again and Cracco was therefore hired for the opening of the Brescia restaurant L'Albereta Resort's Erbusco. 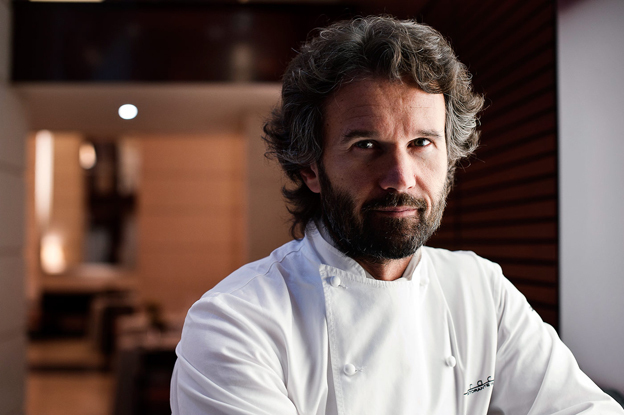 Cracco stayed for a further three years before moving to Piedmont, where he opened the restaurant Le Clivi in Cuneo and, after just 12 months, he was awarded a Michelin star. Several appointments later, and after putting his name to Ristorante Cracco, he was offered the opportunity to become one of the judges on the internationally successful television franchise MasterChef, where his good looks and no-holds-barred approach won him many fans. With his limpid eyes and honeyed voice, it’s easy to see why he’s courted by television companies and following his stint on MasterChef Italia, he is now the mentor on the Italian version of Hell’s Kitchen. But don’t be fooled, for beneath the tousled hair and handsome charm lies a passion for cooking that can, at times, be brutally forthright. The Renaissance cook and author Bartolomeo Scappi had the honour of cooking for six popes during his lifetime and was in fact working at the Vatican at the same time that the Sistine Chapel was being frescoed by Michelangelo. His date and place of birth is contested by scholars with many believing it to have been around 1500 and possibly in Bologna. Although much of his early life is open to speculation, his career was well documented within his books. In 1536, he was in the employ of Cardinal Lorenzo Campeggi, and wrote in great detail about a banquet given in honour of the Holy Roman Emperor Charles V.
In 1549, he was working for Pope Paul III and, following the pope’s death, Scappi again described the food served to the cardinals during the resultant conclave to elect his successor. He went into great detail about how dishes were designed to prevent poison or secret messages being added. Hearsay tells of the cardinals enjoying his food so much that they deliberately prolonged the conclave. He went on to cater for Pope Julius III, whose term in office was plagued by scandal, and the next four successive candidates. 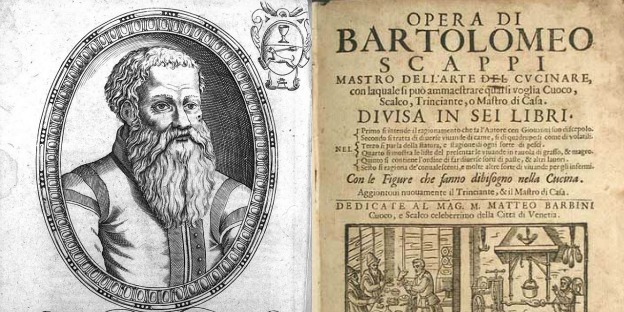 "Opera di Bartolomeo Scappi, mastro dell'arte del cucinare, divisa in sei libri", Scappi’s famous cookbook which literally translates as, "The Work of Bartolomeo Scappi, Master of the Art of Cooking, Divided into Six Books", was published in the year of his death in 1570 and, within the best food circles, it became an important work of reference. Book one describes the cooks’ duties, use of kitchen utensils and methods of preserving food. Book two focuses on meat, three on fish and vegetables, four looks at seasonal food and how to cater for travelling nobility, five features cakes and pastries and the final volume is about cooking for the infirm. With over 1,000 recipes and a descriptive insight into medieval food preparation, tastes and procedures, the book became seminal work of great historic importance; much of what we know about food during the Renaissance derives from this important culinary tome. Growing up in Trattoria Vipore outside Lucca cemented Cesare Casella’s love of Italian cooking. Despite his parents' desire for him to become a doctor or choose any other profession outside of a kitchen, at the age of 12, the young Casella had made his mind up and dedicated himself to working alongside his mother as she cooked for the patrons. At 14, he had already enrolled at the Culinary Institute Ferdinando Martini. Following his graduation, with the family orto being home to over 40 species of aromatic herbs, he began to develop the herbal cuisine that was destined to become his culinary signature. With this newfound practice, he began to update Vipore’s traditional recipes and, by 1991, had secured the family restaurant a Michelin star. New York beckoned and, after a period working at Coco Pazzo, in March 2001 he opened his own restaurant, named Beppe, in honour of his grandfather. Casella, with his trademark sprig of rosemary tucked into his top pocket, continued to achieve critical praise and his imaginative take on Tuscan cuisine brought great success leading to his opening Maremma. His Manhattan-based Italian restaurant opened to great critical acclaim cementing his genius within the culinary history books. Over the years a multitude of superlatives have been written and awards received including the restaurant being named as one of New York Magazine’s Top 5 back in 2006. 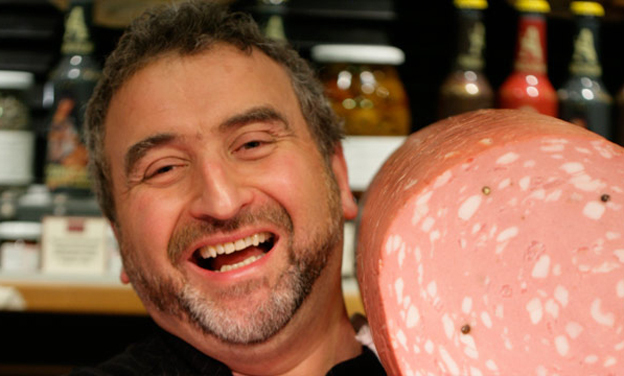 In 2008, in partnership with Parmacotto, an Italian cured meats producer, Casella opened Salumeria Rosi, a traditional Italian delicatessen in Manhattan’s Upper West Side. The venture has proved popular with the local community and has won him more accolades from New York Magazine, the Best Meatballs in New York and four stars in the Critic’s Choice awards. Casella appeared as a guest chef on the TV show After Hours with Daniel Boulud, and has since received the Silver Spoon Award for outstanding culinary achievement. 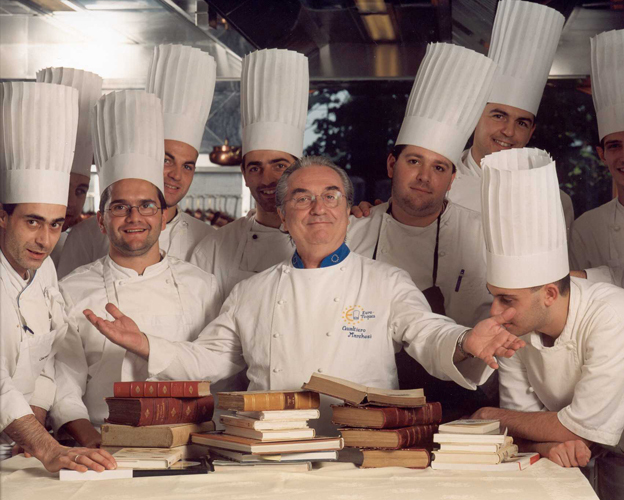 If asked who the most influential Italian chef is, the response is more than likely to be Gualtiero Marchesi. Born in Milan in 1930, he began his training at the Kulm Hotel in St. Moritz and then, in 1948, he went to work at the Ecole Hôteliere in Switzerland before moving back to Italy in 1950 to work in the family restaurant. He soon began to blend traditional cuisine with avant-garde cooking and, still eager to learn more and broaden his range, went on to work at some of the best restaurants in France. In 1977, he returned again to Milan where he opened Bonvesin de la Riva. He attained his first Michelin star in the first year of its opening and in the second year gained a further two stars. He is constantly referenced in cookery guides and many new chefs openly talk of being influenced by him. In 1985, the Michelin guide praised him quoting that he is the first non-Frenchman to be a World Soundtrack three-star chef. More accolades followed in 1986, when he was made Knight of the Republic in Italy; he also received the Golden Ambrogino prize, the highest acclamation from the city of Milan. He was awarded the Golden Seal in 1999 and the Grand Prix Mémoire et Gratitude in 2002. He returned to Milan once again, this time in 2008 to open his new restaurant, The Marquis, which won him many new admirers. In 2009, he was awarded the highest accolade, the Golden Apron, an award most chefs dare not dream of receiving. In the world of professional cooking, it’s fair to say that Gualtiero Marchesi is the chef that firmly put Italian cuisine on the map. In England, Antonio Carluccio is thought of as the Godfather of Italian cooking, therefore, it would be remiss to leave him off a list of eminent chefs. The affable, softly spoken man who was born in Salerno in 1937 is one of the United Kingdom’s most respected chefs. The son of a station-master, he moved to Vienna in 1958 to study languages and it was here that his cooking career began. At first, he would cook simple dishes to feed himself and his flatmate, and very soon his desire to learn more about regional Italian cuisine was awakened. Eventually, he moved to London and briefly worked as a wine merchant before taking over the Neal Street Restaurant in Covent Garden in 1981. It was here that he practiced the art of serving ‘real’ Italian cuisine; regional dishes made from the very best ingredients that can be found. Television was the perfect vehicle for the man with the distinctive mop of white hair and he made his first appearance in 1983; this led to his being asked to write his first book, "An Invitation to Italian Cooking". His popularity continued to grow and very soon he was regular on television both as a guest and presenter, with his last TV series being Two Greedy Italians, where he teamed up with fellow chef Gennaro Contaldo. 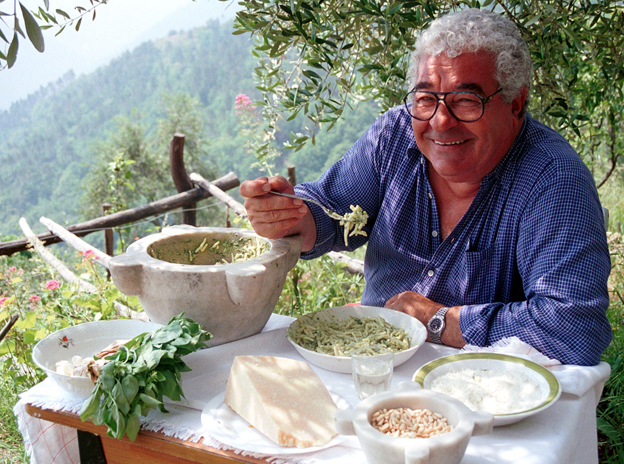 He has thus far written 13 books that have been published worldwide, one of his best being "Antonio Carluccio’s Italia", where he takes the reader on a virtual trip around Italy sharing regional dishes and snippets of culture. In 1998, in recognition for his services to Italian gastronomy, he was awarded the Commendatore OMRI by the President of the Italian Republic and, in 200,7 the UK bestowed upon him an honorary OBE. At 77 years old, Antonio continues to work and shows no sign of slowing down.